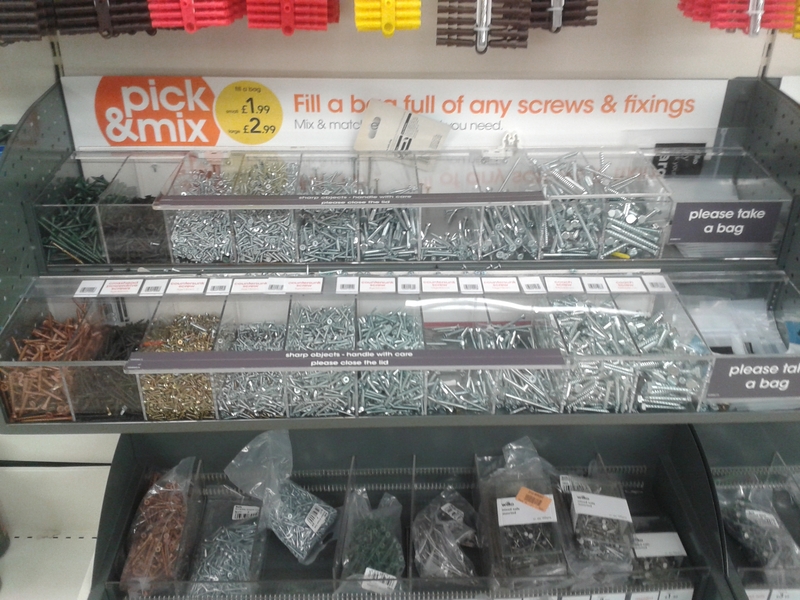 I went to buy screws in Wilkos the other day and found they sell the loose in a ‘Pick ‘n Mix section. You’re supposed to fill either a large plastic bag for £2.99 or a small plastic bag for £1.99 with any of the nails in the bins. But if you take your own container (I used my pocket) – you can avoid the plastic! It’s not quite as simple as it sounds – you need to take one of the bags with you to the counter because that’s where the barcode is but if you explain to the person at the til that you want the bag to stay in the shop (maybe even take it back yourself) the hey presto – plastic free DIY! We’re totally with you on the reducing plastic waste – as part of the ‘Bristol Green Capital’ campaign, we’ve just bought some ‘superconcentrate’ products, thereby reducing our plastic use significantly! Love to know your ideas as to how we could reduce our emissions in other ways too! Just been reading your other blog posts for inspiration too, excellent work! Thank you! I’ve never looked at this superconcentrate stuff, sounds good! Might do a bit of research and do a post about it too, always good to hear about new ways of reducing plastic waste. We are currently working on some recipes for hygiene/beauty products that are easy to make at home to reduce packaging, once we’ve got some good ones we will post them on the blog and let you know! I think my biggest plastic wasters are hygiene products and food packaging so we are looking at how to combat these!